A credit card, in the most basic sense, is a piece of plastic that acts much like a ready-at-the-service loan provider. You use your card in place of cash, check, or debit card to purchase goods and services. It's a loan in that you're borrowing money every time you swipe it, and the idea is that you then pay back (usually in the form of a monthly payment) the principal (amount borrowed) plus interest. 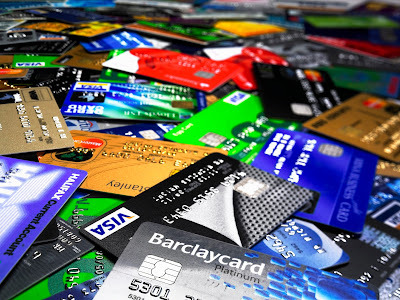 To say that credit cards have been used improperly by many people is an understatement. The average credit card debt per U.S. household in 2017 was $8,177.00. * Meanwhile, the average interest rate on credit cards is 17.4%. ** That means that debt will balloon up by $1,422.80 for a total of $9,599.80. But - and this is a big but - if you're not paying that balance in full the amount of interest you end up paying will be more. The reason for this is compound interest. If you're only making monthly payments, you will get a new finance charge (i.e. interest) each month that will charge you interest on top of your interest. Annual interest rate (in this example 17.4%) divided by 12 months in a year, so 17.4/12=1.45%. 1.45% is how much you're going to be charged in interest on remaining balances. If you make a $300.00 payment against the original balance of $8,177.00, you'll drop the balance down to $7,877.00. Your bank (for example) charges interest at the end of the month, usually after your payment due date. 1.45% is going to be levied against the $7,877.00. This adds another $114.21 to your balance for a total of $7,991.22. This means that only $185.79 of your $300.00 payment has been applied to the principal balance. Your new balance is now higher than it was after you initially made your payment! It's no wonder that people with high credit card debt feel like they're drowning...because they are! They're drowning in interest rates, and it will take a long, long time to pay that balance off making monthly payments. This is especially true if one is only making the minimum payment. So, after looking at the stark numbers, I'm sure some of you are thinking that you shouldn't acquire or use credit cards. Well, if you're one of those kinds of people that are frugal spenders and excellent savers with lots of money in the bank for any emergency scenario, then, no, you do not necessarily need credit cards. In this day and age, if you are one of those kinds of people, a debit card will get you by just fine. You can rest easy knowing that if you have a problem, you can afford to take care of it with your hard-earned savings. However, if you are not one of those kinds of people, then credit cards are a great thing to have on hand. What if your car breaks down and you have a costly repair bill? What if said car breaks down while you're far from home, and you need to get a tow, a motel room, and a car repair? What if the place you're living in is destroyed and you find yourself displaced temporarily? What if you work from home and your computer up and quits running for good one day? What if your grandparent on the other side of the country dies, and you need to book a flight? These are all good reasons to whip out a credit card to get you out of your situation. *** In all these cases, if you use your card just for emergencies, then make more than the minimum payment every month, you should have it paid off fairly quickly. There are other scenarios where using a card is advantageous. I know people who simply prefer to use a card instead of carrying the cash they already have. They use their card, then pay it off in full each month. This works especially well for people who get cash back on their purchases using their card. They spend what they normally would, pay it off before the billing cycle, and then get their cash back at the end of the year. Now, I know these two ways of using cards exist, but I'm not going to get into the specifics on either one of those. I think these latter ways of using a card is better left to people who have good control of their money and spending habits, and who have extra money in which to spend. Where people really get into trouble with cards, is by using them to, basically, purchase all kinds of wants. If you're using your cards to buy clothes, decor, to go out with friends, or to purchase groceries****, then only make the minimum payment on said cards, you shouldn't be using cards. Unless it's an emergency situation, you should never use your cards to buy items you should be using your normal income stream to purchase. If you don't have much money left over after bills, you should be saving money until you can afford to buy wants. What you need to do is to adopt a smart money mindset, something I discussed in detail in this blog post. To sum it up, credit cards can be a blessing or a curse, so choose wisely. If you're new to finances and credit cards, get a basic card with a low credit limit or a secured card. ***** Keep it around for emergencies and pay it off as quickly as possible. Not only will you build good credit, but you'll start to learn how to navigate the world of card ownership. **I arrived at this figure from a list at www.valuepenguin.com. I added together the six average credit card rates and then divided that number by six to get the overall average rate. ***Now, this isn't to say you shouldn't build up an emergency fund because you absolutely should. I've discussed the importance of savings in-depth before. Click here to read more about it. ****Yes, even groceries. You have to purchase wisely and buy what you can afford. It's too easy to spend far too much, time and time again, at the grocery store if you're giving yourself license to purchase whatever you want. You can easily find yourself blowing up your normal food allotment to triple or quadruple what you would normally spend. Don't do it! *****There are two types of credit cards: secured and unsecured. Your spending limit on an unsecured card is determined by your credit history and your income, while your spending limit on a secured card is the amount of a deposit you are required to pay. In this second option, your credit line is secure because you're only allowed to spend the amount of money that you deposited in. The only bad thing with secured cards is that there is usually an annual fee. This is a good option for people with bad credit histories or who are just starting out and feel like they need more guidance.